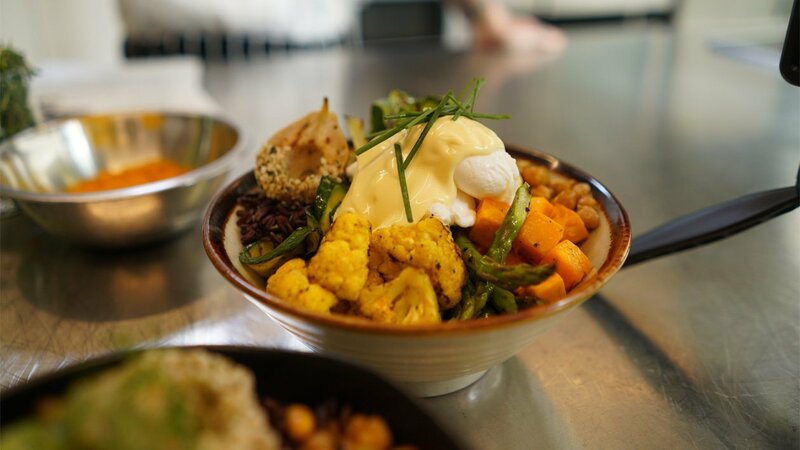 The beautiful char of roasted veggies and nutty flavour of black rice come together for a healthy bowl packed with texture, colour, and goodness. On a heated grill, char the asparagus and zucchini. Remove from heat when char marks appear. In a bowl, dress the cauliflower with a little oil and ground turmeric. Grill until coloured. Spread the diced pumpkin on a baking tray with oil, salt and pepper. Bake until just soft. Place the cherry tomatoes onto a lined baking tray with oil, salt and pepper. Bake until just blistered. Scatter the chickpeas on a baking tray. Drizzle with oil, season, slide, and bake until coloured. Heat some oil in a medium pan. Toss in the pepita seeds with salt and pepper. Toast until golden. Remove from pan. Repeat with the cashews. Warm KNORR Hollandaise Sauce over a low heat. To assemble the bowl, arrange the cooked black rice and veg together. Top with a soft-boiled egg, cut in half. Drizzle with KNORR Hollandaise Sauce, and garnish with seeds and cashews.